Peterborough Phantoms produced a big performance on a big occasion to claim a big scalp last night (November 2). The city team delivered a fine turnaround to earn a 4-3 victory against Swindon in the opening leg of their NIHL Autumn Cup semi-final showdown at Planet Ice. Two goals from player-coach Tom Norton and strikes from Glenn Billing and new recruit Martins Susters were enough to clinch a 10th successive victory in all competitions. It is a result which leaves the tie finely poised ahead of the return clash in Wiltshire next Friday (November 9). 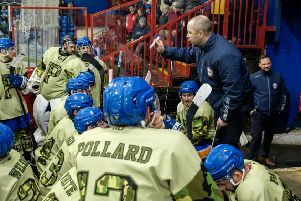 “We played against the best team in the league by far and produced one of the best performances I’ve seen from my guys and full credit to them for that,” said coach Slava Koulikov. “We can’t even compare the rosters so for us to recover from 2-0 down to win the game is really pleasing. “Every single one of my forwards was unbelievable and the ‘D’ guys really dug in as we were down to four men in the last part of the third period. “Guys put their bodies on the line all over the ice. There was not a single poor performance out there. Susters missed out on a dream return to the Phantoms fold when denied a goal in his first shift while linemate Petr Stepanek was also thwarted by Renny Marr. And while the visiting netminder succeeded in keeping the puck out early on, his older brother fared less well at the other end of the rink. Jordan Marr was beaten by a powerplay effort from Sam Jones before being deceived by a floating Toms Rutkis effort as the Wildcats seized the initiative. But the visitors’ ill-discipline, as import Max Birbraer and player-coach Aaron Nell were both called for penalties a split-second apart, handed Phantoms a glorious chance to gain a foothold in the contest. They soon made the most of a five-on-three situation as Norton rifled in a fierce shot from the blue-line, but they were dealt a blow moments later as defenceman Callum Buglass was left concussed by a sickening collision with the frame of his own goal following a needless and somewhat nasty swipe by Jones. The Wildcats player was arguably fortunate to escape with only a two-minute penalty for interference from referee Will Hewitt for his actions while Buglass was unable to play any further part. He missed a magnificent turnaround in the middle session as Phantoms produced arguably the best period of their campaign against what is certainly the finest team they have faced. Their leveller did come complete with a slice of good fortune as an attempted Glenn Billing pass changed course violently and flew into the net following a kiss off a Swindon stick, but the two goals that followed were all about the quality of Koulikov’s side. Both were expertly created by the excellent Corey McEwen with Norton (scoring for the second time on the night) and Susters (scoring for the first time in his second Phantoms spell) the grateful beneficiaries. Jordan Marr produced a fine stop from Nell seconds after that Susters strike to ensure Phantoms returned to the locker-room with a two-goal cushion intact, but the Wildcats chief did succeed in halving his side’s arrears with the only goal of the final period. Nell found the net with a powerplay blast before Phantoms were unable to take advantage of a couple of numerical advantages of their own late on to build a bigger margin of victory. However, the final outcome was an accurate reflection of a contest that was so even the teams recorded identical shot counts of 25. A slender advantage to take to the Link Centre for the second leg is certainly not to be sniffed at given the way Phantoms had to roar back from behind. A fine record at the Wiltshire venue in recent years will provide them with confidence of finishing the job of reaching a final showdown against Sheffield Steeldogs. But the more immediate priority is beating reigning champions Basingstoke in an NIHL Division One South clash at Planet Ice tomorrow (November 4, 5.30pm).